Less than a year after completing a rollout of Windows Phones to its entire police force, New York City Police Department officials plan to begin replacing them with iPhones by the end of the year, according to the New York Post. The report didn't specify whether the NYPD will opt to use one of Apple's latest iPhone models, or an older model like the iPhone 6. Apple is also widely rumored to announce the so-called iPhone 8 with an OLED display in September, although the high-end device may be out of the department's price range. In October 2014, New York City mayor Bill de Blasio and other officials announced plans to roll out 35,000 handheld devices to every NYPD officer for the first time ever, along with tablets for every patrol car. De Blasio said the major $160 million initiative would help bring the department into the 21st century. The NYPD's smartphones of choice were Nokia's Lumia 830 and Lumia 640 XL, released in October 2014 and March 2015 respectively. The since-discontinued devices run Windows Phone 8.1, which Microsoft ended support for in July to focus on its newer Windows 10 Mobile platform and cloud-based services. The devices provide police officers with expanded search capabilities, including access to the majority of NYPD databases, and the ability to conduct various record checks from the field in a timelier manner. The devices also provide real-time 911 call data, often prior to radio dispatch, the department said in 2014. 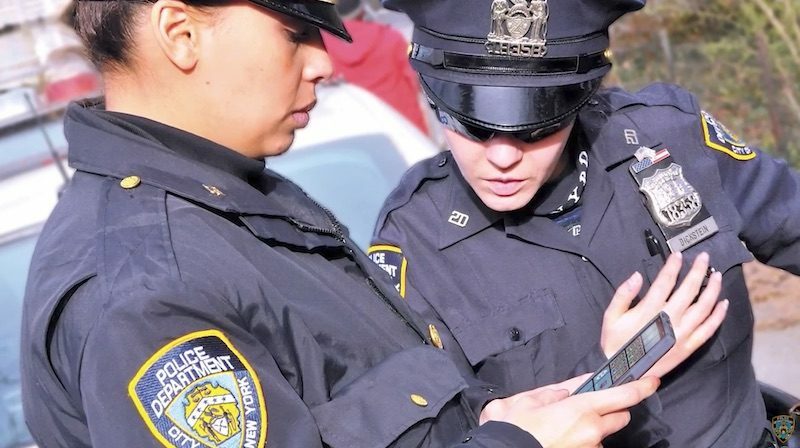 The NYPD's choice of Windows Phones raised some eyebrows given iOS and Android combined have over 99 percent market share of smartphone operating systems, according to research firm IDC. The department insisted on Microsoft-based smartphones in part because it was already using Microsoft software to run the video-surveillance program at its Lower Manhattan Security Initiative Command Center, according to the New York Post. The devices were also more affordable than iPhones. A spokesman for the NYPD said the department wouldn't comment on the matter until its Deputy Commissioner of Information Technology Jessica Tisch returned from vacation later today, the report said. Update: The New York Police Department has confirmed it will begin transitioning to iPhones for its 36,000 police officers in the fall. It also said its mobility initiative has made NYPD police officers "more agile" in their response to 911 calls, with response times down more than 8 percent. The cheap man pays twice. Ah, so they were the ones still using Windows Phones. Why did they bother with Windows Phone to begin with? This is NYC, there was probably a kickback or payoff to someone. Next year, I hear they are going to switch to Blackberry. How many times has the average person on this forum, myself included, paid for an iPhone? I bought the first gen iPad maxed out with 64 gig of flash and the cellular version; hardly being cheap there. And just a couple of years later it needed to be replaced. NYPD apparently bought windows phones a few years ago in 2014 paying $160 million for 35,000 units. iPhone would have been in the same ballpark, they hardly took the cheaper way out, it's time to replace them now and they're choosing to buy iPhones. What does this have to do with a cheap person paying twice? The article specifically mentioned the Windows phones were cheaper. Did you even read it? Hence, if you go the cheap route, you'll pay more in the long run. Because it worked better with their new horse and buggy patrol vehicles. But iPhones have the evil encryption they're all fighting against!